Ingrid H. Onarheim at Lance. Photo: Lars Henrik Smedsrud. North Pole explorers send summer photos of melt water pools and cracks that become harder and harder to cross. If they had winter expeditions, they would see that ice covers as much of the Arctic Ocean as in the past. Only the Barents Sea and the region just north of Svalbard have lost winter ice. The sea ice cover in the Arctic has shrunk, but not as much everywhere, and not at all times of the year. There is least ice in September, the month when the reduction has also been the largest. Since 1970 the areal extent of the summer sea ice cover has been reduced by 50 percent. In the Arctic Ocean, only the summer ice extent has decreased. The winter air is still cold enough to make the water freeze. In the Barents Sea and just north of Svalbard, the situation is different. There, also the winter sees less ice than before, Ingrid H. Onarheim tells. Onarheim is a PhD student at the Geophysical Institute at the University of Bergen, and the Bjerknes Centre for Climate Research. – In the Barents Sea, there is hardly any ice in summer. Thus, it’s obvious that the decrease in the ice cover must be due to less ice being formed in winter. More warm water is the reason. The heat comes from the Norwegian Atlantic Current, which follows the Norwegian coast northward, before splitting into two parts. One parts flows into the Barents Sea, whereas the other continues northward along the west coast of Spitsbergen. During the last decades, both the amount of water entering these seas, and the temperature of this water, have increased. More warm water from the south causes less ice to form. The association between the warm water that flows into the Barents Sea and the amount of ice formed in winter is so strong that Ingrid and her colleagues can predict the area of the ice cover a year or two ahead. 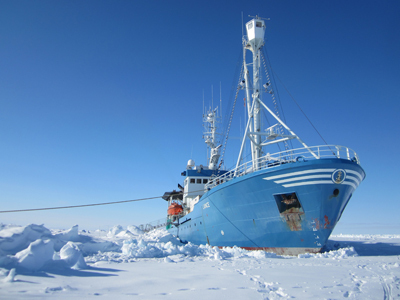 In May last year, Ingrid spent three weeks onboard the research vessel Lance, which was frozen into the ice north of Svalbard. 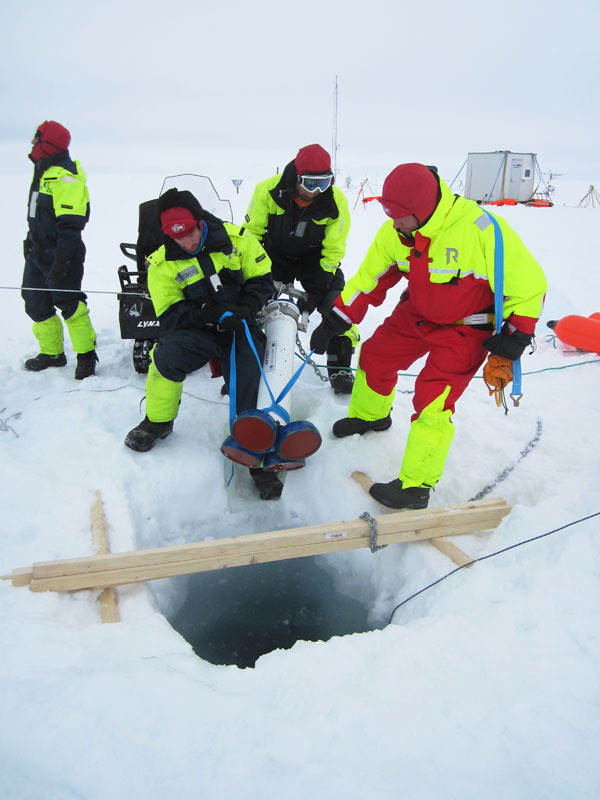 Every day she went out on the ice and lowered instruments down through a hole. 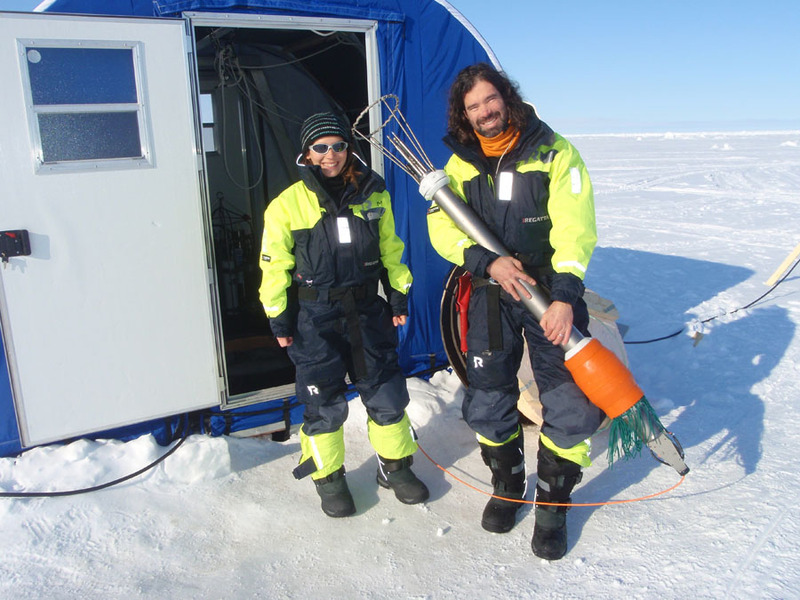 Working 12-hour sessions outside, she gathered a lot of new data describing the ocean currents under the ice. North of Svalbard, there is sea ice both in winter and summer. Thus, the observed reduction can be due both to less ice being formed in winter and to more melting in summer. – It’s a competition between the ocean and the atmosphere, Onarheim says. – There are large geographical differences, but my theory is that the ocean is most important in winter and the atmosphere in summer. The western branch of the Norwegian Atlantic Current flows through the Fram Strait, to the west of Svalbard. North of Svalbard, where the relatively warm, Atlantic water meets the ice edge, the Atlantic water sinks under the ice. As a result, only the ice near the ice edge is in contact with the warm water. It does not affect the growth of winter ice closer to the North Pole and in the Russian and Canadian sides of the Arctic Ocean, and the winter ice cover has not decreased in those regions. In winter, the air temperature is above the freezing point only for short periods, and it would require much more for warm air to melt thick ice. The air temperature in winter is truly higher when there is little ice and more open water, but this does not mean that the open water is caused by warm air hindering ice growth. Ingrid H. Onarheim believes the opposite is the case: When there is more open water, the water loses heat to the air above, which gets warmer. – They’re exactly in step, she explains. – The air temperature responds immediately to changes in the ice cover. In this column starting spring 2016, we will present some of our young talents. Overall objective: to assess the fundamental structure and operation of the Atlantic thermohaline circulation’s northern limb and thus constrain its mean state, variance, and sensitivity related to ob- served and projected climate change, including possible feedbacks. Partners: Woods Hole Oceanographic Institute, University of Washington, Danmarks Meteorologiske Institut, Det finske meteorologiske insitutt, University of Stavanger and the four Bjerknes Centre partners: Nansen Environmental and Remote Sensing Centre, Institute for Marine Research, University of Bergen, and Uni Research..